Whether you are an Anglophone learning to speak French or a Francophone learning to speak English, there are many great options available for bilingual dictionaries. Students, travelers, and those who just want to learn another language all can take advantage of some great dictionaries. If you are working online or if you want to save time you would otherwise spend looking up words, an online dictionary can be a helpful tool. In most cases, a printed dictionary is more thorough, so if you're looking for nuanced translations, stick with one of the more expensive and thicker printed dictionaries. French Linguistics Dictionary: With the click of a button, switch from French to English and back again. This translating dictionary will save you lots of time flipping through the pages of a dictionary. Lexilogos: This is a favorite online dictionary because it offers almost all the online dictionary options on one website. Simply type in a word and then select the specific dictionary you would like it to use to look up what you typed in (French unilingual dictionary or French to English dictionary, etc.). Lastly, to aid you in typing in the text to look up, there is a box of common French accents that you can insert into the typing box with a single click. Google Translate: Type in any word you need to look up, select the language you are typing (or click on the 'detect language' button) and then select the language you want. From French to English and back again, it's one of the quickest ways to translate a quick word or phrase. Users can contribute to correct common errors, and there is a speaker icon that you can click to hear the phrase or word spoken. While it's not perfect, it is rather useful for a word here or there. Collins: The same people who publish the Collins French Dictionary books also have an incredibly useful site for those learning to speak French. Toggle either English to French or French to English, type in your phrase and the site will look it up for you. WordReference.com: A must-have tool for the student, this site provides an excellent online dictionary, particularly for phrases. When you type in a phrase, you get a full entry explaining the various nuances of what you are looking up. This site is a user-driven community, so when you look up a word or phrase, you also get links to forums discussing that phrase. The forums are populated with native and bilingual speakers who can often answer a question about why or when a word or phrase is used. A few companies have made their dictionaries into well-known resources. 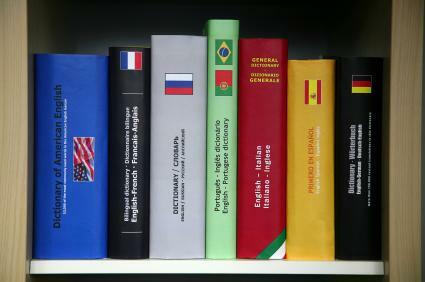 The following dictionaries are likely to be available in public and university libraries, as well as local bookshops. If you're not majoring in French, but need a good college dictionary, the abridged version of the Collins Robert is a good choice. For many students, Larousse is their first French/English dictionary. French to English dictionaries can help you do your French homework, translate phrases you read or heard somewhere, and find all the many English words borrowed from French. If used carefully, dictionaries can make a great contribution to learning French and building your vocabulary long after you have become fluent.